With a variety of multi-vitamin supplements in the marketplace, which one is the best one for you? Whether you are an elite athlete, a “weekend warrior”, a multi-vitamin should deliver more than just your daily required amounts of vitamins and minerals. At Prosupps®, we believe your multi-vitamin should be held to a higher standard, a standard that answers the call of a COMPLETE performance vitamin supplement. From joint support in glucosamine and chondroitin, to weight management components CLA and Raspberry Ketones, VITALINX delivers a highly-absorbable formula that assists in recovery and aids in elite performance. Men and women with varying levels of activity benefit from adequate vitamin and mineral support. 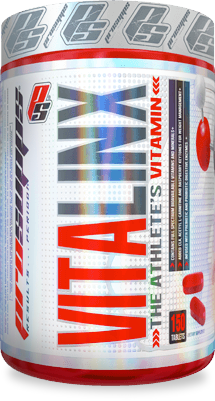 If “performance” for you is professional sports or chasing kids around the playground, VITALINX delivers the proper nutrition to make that performance the best-in-class.